So I lied. I just wasn’t feeling the olives. Well that and I knew that the basil I had in the fridge was going to go all soggy gross ick on me soon (enter more thoughts re: owning my own herb plants…reminded of this post…thoughts begrudgingly step aside). 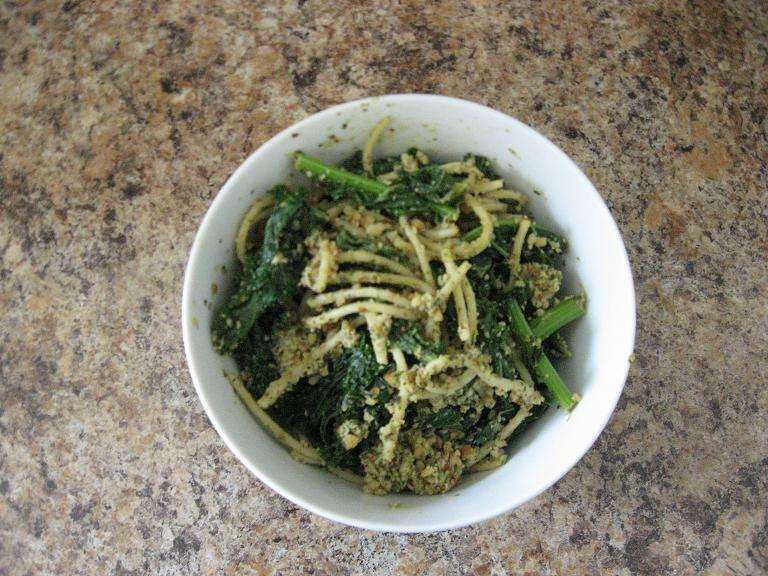 Instead, I decided to cook up a pesto-y pasta dish from Eat, Drink and Be Vegan. The recipe calls for cashews but I replaced them with almonds because a) cashews are more expensive and if I wanted expensive, I’d go with pine nuts, b) cashews are more fattening (not that I’m watching my weight or anything, but I am aware of the fact that I’m not getting any younger and my metabolism isn’t what it used to be. Case in point: after a week of drinking and eating fatty Scottish food, I actually put on weight. Oh the horror), and c) I had almonds on hand. The recipe also calls for dry mustard but I had a nice peppery dijon in the fridge that worked just fine. Finally, this book suggested topping the pasta with sliced cherry tomatoes and serving it with a salad. I did not. First, who the hell slices cherry tomatoes? Halve them, sure, but slice? Pfft. And second, I have no patience for salads. Too much work for a side dish, in my humble opinion. I decided to mix in some tasty kale with a pinch of coarse sea salt. The result was most excellent. In a food processor, combine garlic, lemon juice, dijon mustard, salt, pepper, olive oil, water, almonds, and basil and blend up until fairly smooth (this can be frustrating…I would start by chopping the garlic, then add everything except the basil and almonds and blend up for a bit, then add the almonds and basil in batches). Set aside. Cook the pasta (I chose spaghetti but would go with spaghettini next time). Once pasta is done, drain but set aside a bit of the pasta water. Mix the almond fun in with the pasta – if it is too dry, add a bit of the pasta water. Serve with the all important leafy greens. Yummy! !